Apollo 11 Space Capsule Gets Restored For A National Tour In 1969 it was the orbiting home and refuge for the first astronauts who walked on the moon. Today, after decades on display in a Smithsonian museum, the module is being restored for a national tour. The Apollo 11 capsule in in sore need of restoration, conservation specialists say, if it's to last another 50 years. Even the adhesive that helps holds stuff in place is losing its stickiness, and some objects inside are starting to pop off. 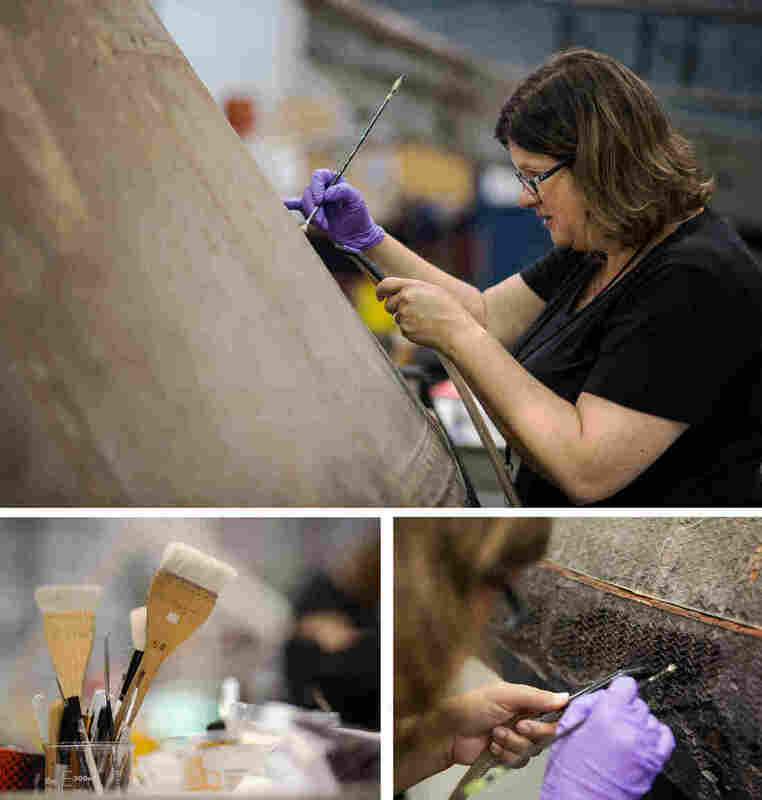 "But it never really went under a full examination or investigative analysis as to all of the certain materials on there, how stable they are," says Young, who is working on the spacecraft now in a restoration hangar at the Smithsonian's Steven F. Udvar-Hazy Center in Chantilly, Va., outside of Washington, D.C.
"Our big job as conservators right now is to figure out, if we are going to put it back on display permanently, what could be happening to it in 50 years," says Young, who wants to prevent future deterioration. Objects conservator Lisa Young, of the National Air and Space Museum, cleans the honeycomb lattice by using a small bristled paint brush to flick dust from the capsule into the vacuum cleaner. Inside the capsule, for example, the adhesives used to help stick things to the walls are becoming more crumbly and losing elasticity. "So it's starting to have things pop off," says Young. "We want to go back in and make sure that all the adhesives remain stable." The mint green paint on those walls also needs some tender loving care — it's starting to flake. 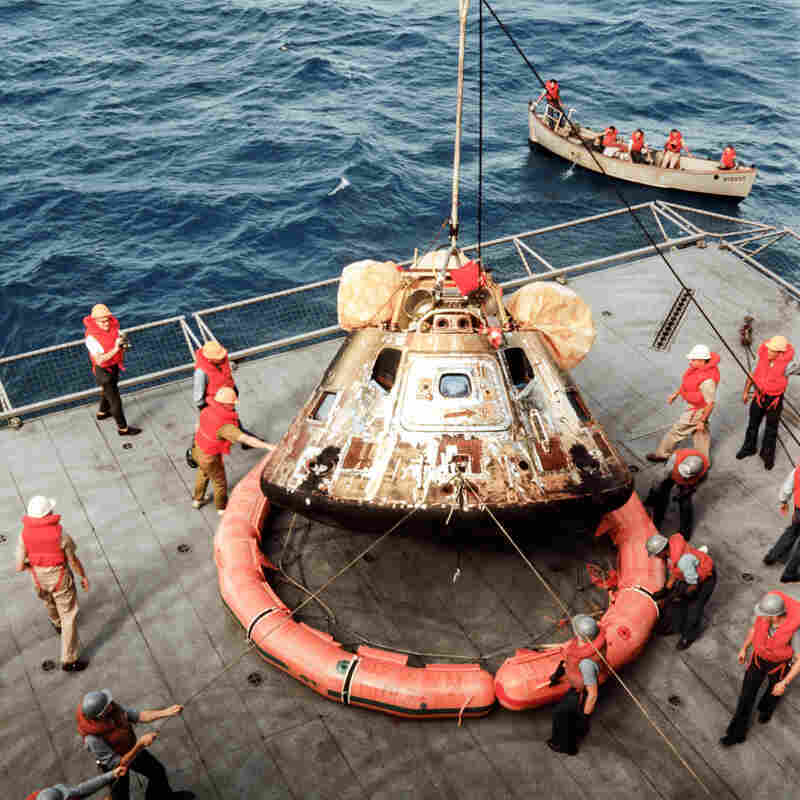 The Apollo 11 Command Module Columbia, with astronauts Neil Armstrong, Michael Collins and Buzz Aldrin aboard, splashed down southwest of Hawaii on July 24, 1969, and was brought aboard the USS Hornet. Another job on the to-do list is salt removal. This capsule did splash down in the ocean, after all, and partially filled with saltwater. "Salts embed themselves in materials and then creep out later," says Young. And then there's the dust. Young holds a vacuum near the spacecraft's charred heat shield and uses a small paintbrush to gently sweep off dust. "You actually just want to loosen the dust so it becomes airborne and goes into the vacuum," she explains. She expects to spend about a month just cleaning the surfaces. "I'll probably be doing a little bit more on the top where we do corrosion removal and fabric repair," says Young. The point of all this cleaning and repair is preservation — not to make it look shiny and new. "One of the things, you know, about space objects that you want to make sure," she says, "is that you leave all of its evidence from space." That means unique stuff — like the burn marks from its fiery re-entry, and the numbers scribbled by astronauts on the walls — will all stay. 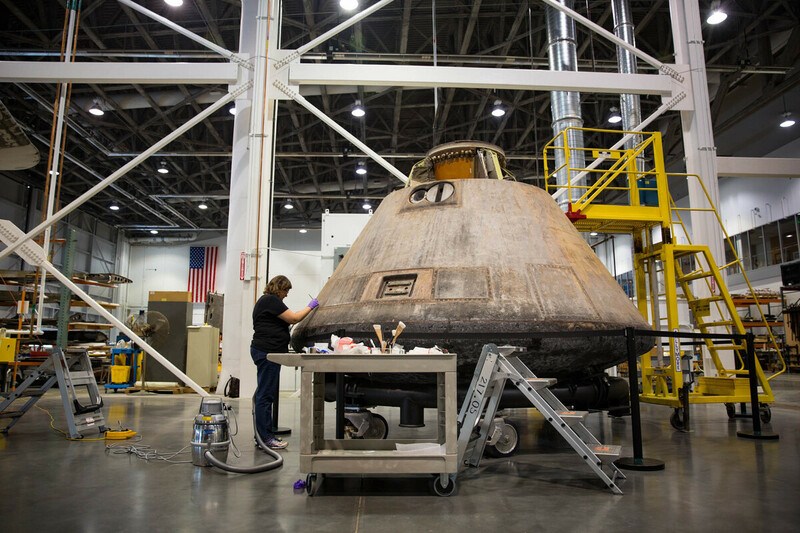 After the work is done, the Apollo 11 capsule will be ready to visit museums in Houston, St. Louis, Pittsburgh and Seattle. Then it returns to the Smithsonian's National Air and Space Museum, to be displayed in a brand new, environmentally controlled glass case as the centerpiece of a gallery called "Destination Moon."